Wolfgang Plastik Surface Sealant forms a clear barrier over your plastic lenses to shield them from contamination and UV rays. Home > Shop By Brand > Wolfgang Concours-Series Car Care > Wolfgang Plastic Surface & Headlight Sealant 8 oz. Wolfgang Plastic Surface & Headlight Sealant 8 oz. If your lenses haven’t succumbed to the elements yet, you can prevent clouding with Wolfgang Plastik Surface Sealant. Wolfgang Plastik Surface Sealant forms a clear barrier over your plastic lenses to shield them from contamination and UV rays. The sealant is formulated to seal clear plastic without streaking or yellowing. It dries crystal clear so your headlights look and perform better. Rather than lighting the road ahead with a dull, filtered glow, you’ll see bright beams of light shining on everything in your path. It’s much safer and your vehicle will look great with a clean set of lenses. By blocking out UV rays, this sealant prevents the clouding that occurs on older lenses. Wolfgang Plastik Surface Sealant is just one more way to maintain your vehicle’s youthful appearance! If you’ve used the Wolfgang Lens Cleaning System, including Wolfgang Plastik Lens Cleaner and Wolfgang Plastik Lens Glaze, seal in the clarity with Wolfgang Plastik Surface Sealant. 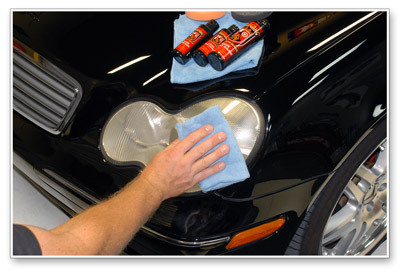 If your vehicle is new, the sealant will keep them looking new for the life of your vehicle. 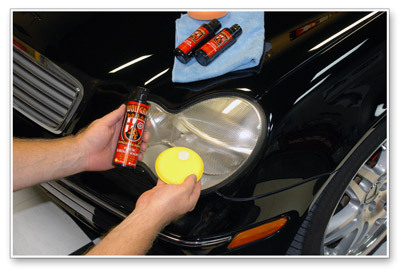 Maintain the cleanliness and clarity of your headlight lenses with Wolfgang Plastik Surface Sealant. For new and restored lenses, there’s no better way to prevent clouding. Wolfgang Plastik Surface Sealant 16 oz. Wolfgang Plastic Headlight Lens Cleaner 4 oz. Wolfgang Plastic Headlight Lens Glaze 4 oz. The label states reapply every 2 to 3 months. When used as directed this is an outstanding product! the fact that the system only protects for several months. Has my customers in a snit. they think and rightly so that the cost is to high for the short amount of time the lenses stay clear before touch-up time.Which they don't want to pay for.Texas, gotta love it, or maybe move soon. I painted my taillights with this and even without a clearcoat, this sealant bonded perfectly and has been protecting them for the past few days with awesome water beading capabilities. Likewise, this is a very good product to consider to prevent head light housings from hazing and premature aging.